The Dow Jones Industrial Average today (Thursday) was down 127 points heading into the final hour of trading for 2015. The S&P 500 looked as though it was going to finish the year flat, ending a long year of volatility, big gains for tech giants, and a huge downturn for many energy stocks. 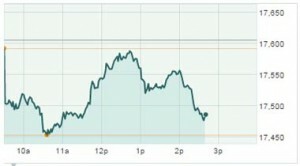 As of 2:40 p.m., shares of Apple Inc. (Nasdaq: AAPL) were down 2% and were the largest weight on all three major indexes. The tech giant had its first down year for its stock since 2008. On the economic front, the number of Americans seeking unemployment benefits rose more than expected last week. According to a report from the U.S. Labor Department, unemployment claims jumped by 20,000 to a seasonally adjusted 287,000 for the week ending on Dec. 26. The increase is likely linked to the end of the holiday shopping season. It was the largest increase since July 2015. Stock Market Today: Nine of the 10 major S&P sectors were negative on Thursday, with energy stocks the lone gainer. On a day of relatively light volumes, the biggest news was geopolitical. In Iran, the nation's president Hassan Rouhani issued an order to expand his country's missile program. The announcement is a direct response to a recent threat by the United States to impose economic sanctions over an October missile test by the Iranian government. Oil in Focus: Oil pricesgained slightly on news of a major storm in the North Sea and data stating two oil rigs were removed from production last week, according to the weekly count from Baker Hughes Inc. (NYSE: BHI). February's WTI prices were up 1.5% at $37.15 per barrel. Meanwhile, Brent oil crude – priced in London – gained 2.8% to hit $37.89. The sector's most active traders today were Exxon Mobil Corp. (NYSE: XOM) and Chevron Corp. (NYSE: CVX), which were down 0.1% and up 0.01%, respectively, as of 2:40 p.m.
On Tap Next Week: On Monday, traders will kick off 2016 with a focus on fresh economic data. Investors will want to keep an eye on the monthly PMI Manufacturing Index, an update on construction spending, and the Gallup US Consumer Spending Measure. No major U.S. companies are expected to report quarterly earnings on Monday. On Tuesday, the earnings calendar will kick back into gear when Sonic Corp. (Nasdaq: SONC) and SUPERVALU Inc. (NYSE: SVU) report results. Stocks to Watch No. 1, WPX: Shares of WPX Energy Inc. (NYSE: WPX) jumped more than 11.6% after the energy company announced it divested its San Juan Basin gathering system for nearly $310 million. The Tulsa-based company is just one of many energy stocks hovering near 52-week lows and looking for creative financial solutions to address concerns regarding their financial debts. Stocks to Watch No. 2, CMRX: Shares of Chimerix Inc. (Nasdaq: CMRX) gained more than 8% after hedge fund manager Steven Cohen announced his firm Point72 Asset Management has built a 5.3% stake in the biotech firm. The announcement comes just a few days after shares of the biotech company cratered more than 80% after it reported negative results from a late-stage drug trial. Stocks to Watch No. 3, AAL: Shares of American Airlines Group Inc. (Nasdaq: AAL) were off 1.3% after the company finally announced it completed its merger with U.S. Airways Group, a deal that took place in 2013.